Cynthia joined Weare Animal Hospital in May 2018. Cynthia was in the medical field for 9 years before she decided to start in the Veterinary field. 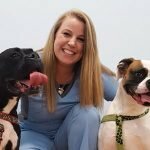 Once she got her foot in the door in the Veterinary field she knew that was what she wanted to do and hasn’t turned back. She has excellent customer service skills and you can always find her with a smile on her face. Cynthia lives in Manchester with her daughter, Estelle and her two boxers, Halley-Mae & Louie. Cynthia likes to be outdoors running or in the woods either 4-wheeling, hiking or camping.